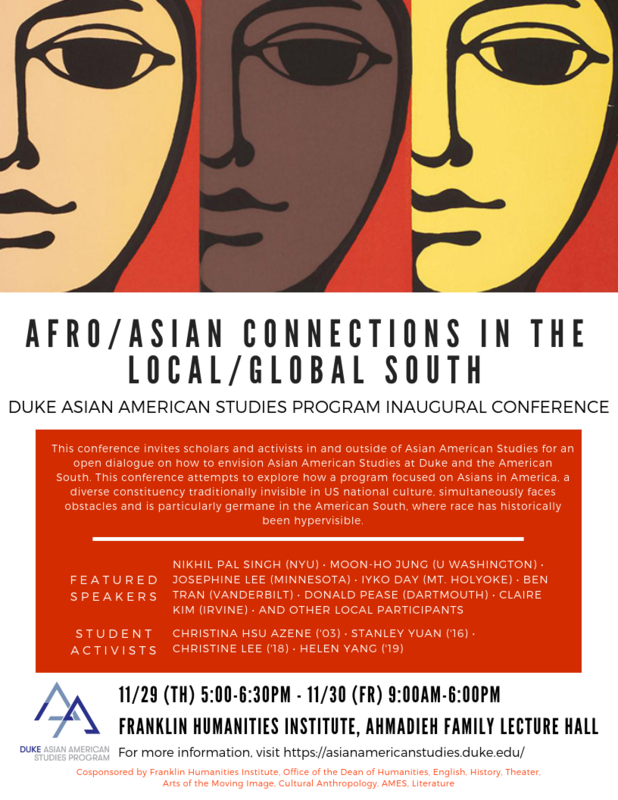 This conference invites scholars and activists in and outside of Asian American Studies for an open dialogue on how to envision Asian American Studies at Duke and the American South. Since its origins in San Francisco State University at the height of the civil rights and antiwar movements of the global sixties, Asian American Studies has its roots in intersectional community and coalition building with allied social movements such as civil rights, women’s rights, and third world decolonization. On Duke campus, Asian American activism also has strong ties to African American Studies and Middle Eastern Studies. However, these communities have faced challenges in building coalitions for common goals, institutionally siloed into competing enclaves for resources and visibility. This conference attempts to explore how a program focused on Asians in America, a diverse constituency traditionally invisible in US national culture, both faces obstacles and is particularly germane in the south, where race has historically been hypervisible. Afro/Asian Connections looks back at common histories and looks ahead at how to harness that energy as we begin the hard work of building new communities and coalitions, toward a program that is at once grounded in the local South and globally engaged with the global South. 5:15PM – 6:45PM: Keynote 1 – Claire Kim (UC Irvine) "Are Asians the New Blacks? Affirmative Action, Antiblackness, and the ‘Sociometry’ of Race"
Iyko Day (Mount Holyoke) "Settler Colonial Racial Capitalism and Asian American Studies"
Nikhil Pal Singh (NYU) "The Problem of Race and Comparison"
Ben Tran (Vanderbilt) "New South, Global South, and Postsocialism"
Josephine Lee (University of Minnesota, Twin Cities) "The Shared Spaces of Blackface and Yellowface on the Southern Vaudeville Circuit"
Co-Sponsored by Franklin Humanities Institute (FHI) and Humanities Futures, Dean of Humanities, Asian & Middle Eastern Studies (AMES), English, History, Cultural Anthropology, Program in Arts of the Moving Image (AMI), Theater Studies, Literature.